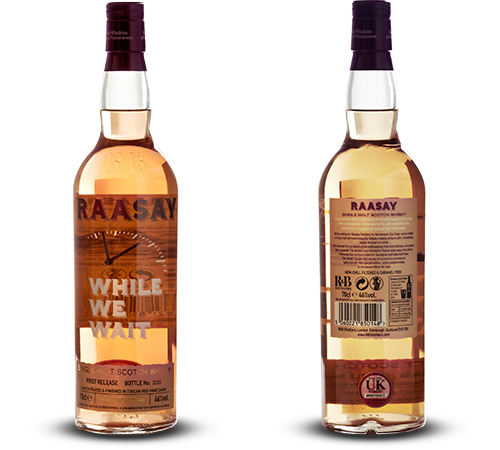 The Raasay Distillery from R&B Distillers was initially part of a diptych dreamed up by Alasdair Day. The Borders distillery has been (temporarily) shelved, but the Raasay distillery is up and running. The first youngster-whisky is to be released somewhere in 2020. In the meantime, we already got a taste of things to come with the While We Wait whiskies. This single malt is a blend of unpeated and lightly peated malt whisky from the same unnamed distillery. The liquid was finished in Tuscan red wine casks. Colour: Dark gold with a slightly red copper hue and thin fast legs. Nose: Young and grainy. Dark chocolate and fresh figs. Buttered corn bread with slightly smoked and burned chillies. Still some clear notes of the mash with added spices: cumin seeds, cinnamon, juniper berries and pickled jalapeño peppers. Ginger and some cheesy notes. With water: Spicy chai tea with honey. Taste: Sweet and spicy. Cinnamon, cumin, pepper, aniseed and mustard seeds. Currant and cornbread. Prunes, blue grapes and strawberries. A whiff of sour notes and some smoke. With water: Sweet pepper and smoke. Honey, cornbread and caramelised figs. Finish: Dry and sweet with touches of red fruit. Some sunday reading... With a dram. Again a bit of an unusual expression with those cheesy notes but a very solid whisky. The smoke is barely noticeable yet it gives a bit of depth to the basket of red fruits and figs. I'm looking forward to try the first official releases from the Isle of Raasay... The first release was marketed around €55.